Together, Art Miami and its new sister fair, Context, field more than 190 dealers. 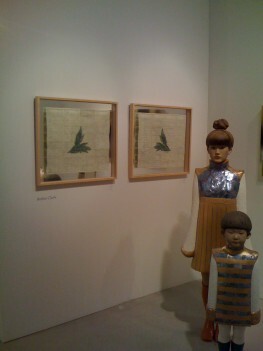 At 23, Art Miami is the oldest contemporary art fair in the city. It features 125 well-established modern and contemporary art exhibitors. Context gathered 65 dealers from the younger, edgier side of the spectrum, adding 45,000 square feet of exhibit space to Art Miami’s 125,000 square feet. Both shows opened with packed previews Tuesday in side-by-side tents in Miami. At Dillon Gallery, the come-hither piece was Robin Clark’s deceptively simple ink painting Floral. It’s a clean work in which a green sprig of leaves and berries stands out against a faint gridlike background. On closer inspection, the surface is revealed to be a wall of faded dollar bills. Clark extracts the ink from the currency and uses it to paint works featuring details from the bill on the money. The bills are mounted on a mirrored backdrop that reflects a checkerboard of untouched dollar bill backs. The color harmonies, repeated forms and isolated detail combine to make the image beautiful, but “there’s also a political statement, just because of the material,” said Oswald Di Filippo, one of the gallery’s directors.